OTTAWA -- Canada's ambassador to China admitted to an ill-timed and politically explosive slip of the tongue when he suggested detained Huawei executive Meng Wanzhou had a strong case to avoid extradition to the United States. John McCallum's surprise mea-culpa on Thursday was the latest head-snapping development in the saga of Canada's fallout with China over Meng's arrest. It came just hours after Prime Minister Justin Trudeau publicly defended him in the face of Conservatives demands to fire him. "I regret that my comments with respect to the legal proceedings of Ms. Meng have created confusion. I misspoke," McCallum, a former Liberal cabinet minister, said in a statement. "These comments do not accurately represent my position on this issue. As the government has consistently made clear, there has been no political involvement in this process." McCallum's candid comments about Meng's legal case, made Tuesday to Chinese-language journalists in the Toronto area, raised eyebrows and fuelled speculation they were a political ploy to end Ottawa's deepening diplomatic crisis with China. "As Canada's Ambassador to China, I play no role in assessing any arguments or making any determinations in the extradition process," McCallum said Thursday. "The Canadian government's priority -- and my priority -- is securing the release of the two Canadians arbitrarily detained in China and ensuring that the rights of all of our citizens are protected." In the days that followed Meng's Dec. 1 arrest, China detained Michael Kovrig, a Canadian diplomat on leave, and Michael Spavor, an entrepreneur, on allegations of endangering China's national security. They remain in Chinese custody. Earlier Thursday, Trudeau dismissed calls to remove McCallum from his post. He said his government's focus is on getting detained Canadians Michael Kovrig and Michael Spavor home safely from China and ensuring their rights are respected and recalling McCallum wouldn't achieve that. "Making a change would not help release those Canadians a day sooner," Trudeau said. 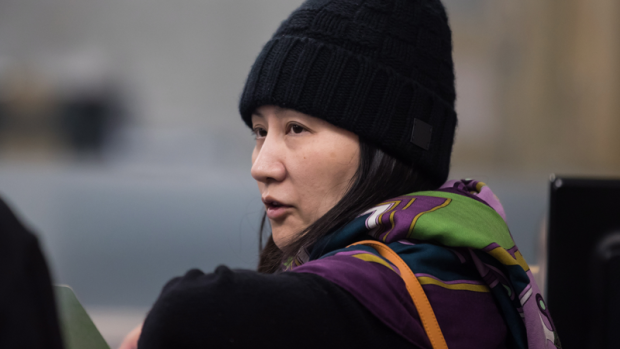 China's foreign ministry spokeswoman Hua Chunying said her government "noted the relevant remarks by Ambassador McCallum" and reiterated its demand that Meng be released from her unjust detention, which she blamed on Canada and the United States. "We have made our stern position clear," Hua said Thursday, in translated remarks from her ministry's website. "In order to change the current situation, the Canadian side needs to face up to the issue squarely, take China's solemn concerns seriously, and take measures to correct its mistakes." "We hope that the Canadian side will make the right choice instead of risking endangering itself for other's gains," Hua said. At the top of McCallum's list of Meng's legal options was a possible defence on the grounds of political interference following comments by U.S. President Donald Trump last month that he might intervene in Meng's case if it would help him nail down a trade deal with China. Experts said that while McCallum's remarks might have been controversial on the surface, the substance of his legal analysis was not far off the mark. "In general, his comments in that respect were not out line with what some experts were saying," said Paul Evans, a China expert at the University of British Columbia. "What was significant was he said it to basically a Chinese media audience." Henry Chang, a Toronto immigration lawyer, said McCallum was advancing some "potentially viable arguments here ... However, I don't think he should be speaking so confidently since these issues will ultimately be decided by the courts." "We will always stay grounded in defence of the rule of law and the integrity of our justice system, which of course includes the capacity for people to defend themselves enthusiastically which will be fully afforded to Ms. Meng and in her rights within the Canadian justice system," Trudeau said. Following Meng's arrest, China also sentenced another Canadian, Robert Lloyd Schellenberg, to death in a sudden retrial of his drug-smuggling case. Schellenberg had initially been sentenced in 2016 to 15 years behind bars. Foreign Affairs Minister Chrystia Freeland has asked for clemency for Schellenberg and has called his death penalty "inhumane."